SAN DIEGO (NEWS 8) — Throughout its almost 70 years on air, News 8 has captured the stories of San Diego as they happened. Our archives hold so much history and we are thrilled to be able to share pieces from it with viewers. In 2018, we launched News 8 Throwback and began a deeper dive into our archival footage thanks to News 8 Editor Barb Nielsen who used her vast knowledge of and passion for San Diego history to gather and edit hundreds of throwback videos. Digital Content Producer Jennifer Lothspeich partnered with Barb on the project crafting the stories to present the video content. In the archives, we found everything from the neon lights that once lit up El Cajon Boulevard to concerts that rocked San Diego Stadium. In the nearly 150 throwback clips we posted this year, we resurrected celebrity sightings, took you behind-the-scenes in our newsroom and featured how San Diego traditions like Over the Line tournaments evolved through the years. While many of the clips we uncovered showcase the sun and fun of San Diego, we also honored somber moments in our city’s history by sharing archive footage of the wildfires that ravaged neighborhoods in the 2000s and the devastating PSA Flight 182 crash of 1978. 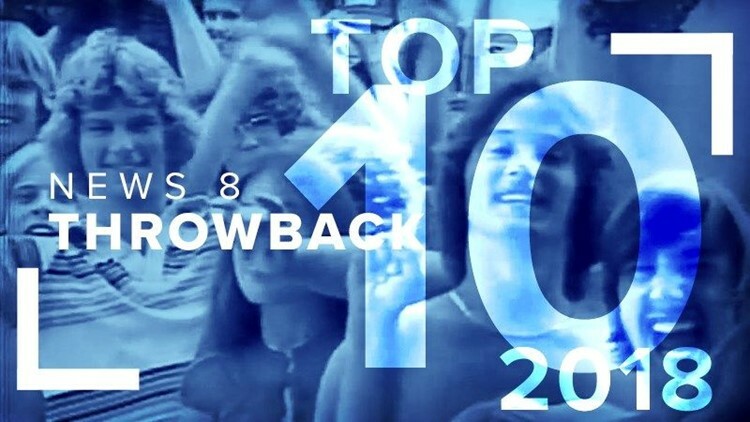 Here is a look back at the Top 10 News 8 Throwback videos we brought you in 2018. We plan to bring you many more in 2019! Though this News 8 footage from 1958 doesn't have sound, it still captures the mesmerizing nature of Marilyn Monroe. Marilyn along with co-star Jack Lemmon are seen filming scenes for "Some Like It Hot" on Coronado Beach while groups of fans crowd around to watch. 60 years later, this video was one of the most-viewed on News 8's YouTube channel, proving the stunning staying power of the legendary celebrities seen in it. News 8’s 1978 “Our Town” series featured over two dozen San Diego neighborhoods. We have shared several on our YouTube page so far from Rancho Bernardo to Chula Vista and everywhere in between. Plus we will continue to add clips from this collection in 2019. The La Mesa edition received the most attention of the “Our Town” clips on News 8’s YouTube channel. The self-proclaimed "Jewel of the Hills" was like living in a Norman Rockwell painting, according to narrator Doug Oliver. It was 1978 and El Cajon Blvd in San Diego, California was lit up like a Christmas tree. Neon signs were everywhere. One of the most iconic was at the Campus Drive-In with the girl twirling a baton. 40 years later, many of those signs are gone but live on in our archives. We started our News 8 Throwback playlist using this vintage clip. On her very first tour, Madonna came to San Diego and played two concerts at SDSU Open Air Theatre. This News 8 piece opens with Madonna's hit "Holiday” and features many girls dressed in iconic 1980s Madonna fashion. We shared this footage just two weeks ago and immediately received many excited comments from fans of the Material Girl. The date was August 5, 1979 and chances are, if you were a rock 'n' roll fan, you were probably there; 55,000 revelers (including Digital Content Producer Jennifer Lothspeich’s own parents) packed San Diego Stadium that day to see Blue Oyster Cult, Cheap Trick, UFO and Pat Travers. On July 8, 1993 the annual OMBAC Over the Line tournament was underway at Fiesta Island in San Diego Bay. 25 years after this piece, the tournament was still going strong in the summer of 2018 and next year will celebrate 66 years as a tradition in San Diego. A heat wave in August of 1992 sent folks in San Diego scattering to beaches and other bodies of water. When San Diego experienced another heat wave this summer, we shared this pair of clips with News 8 reporters Chris Saunders and Loren Nancarrow showcasing how locals dealt with rising temperatures over two decades ago. Scripps Ranch High School opened its doors to students for the first time on Sept. 7, 1993 and News 8’s Lorraine Kimel was there to capture the excitement. We shared this video just before the school’s 25th anniversary and received many comments about the lack of cell phones in the teens’ hands. At the height of his Magnum, P.I. popularity, heartthrob Tom Selleck made a trip to San Diego to compete in a volleyball match of all things. Decades later the footage garnered many comments on social media. One YouTube user even spotted his late father in the clip. Several of the most viewed videos on our You Tube channel were shared around the 40th anniversary of PSA Flight 182 crash, which occurred in the North Park area of San Diego on September 25, 1978. Anyone who lived here at that time will never forget the tragedy that occurred when a PSA airliner collided with a Cessna in mid-air over our city. Our most viewed throwback video this year was this clip of raw footage from the day of the crash, which we want to warn you some may find difficult to watch. Thank you for taking these trips back in time with us. The history of San Diego is important to those of us that call this beautiful place home. News 8 is proud to keep these memories alive and preserve their impact.